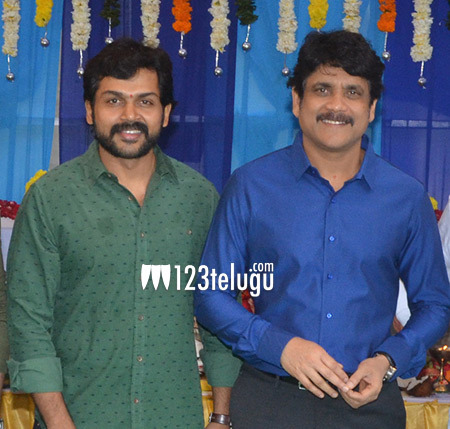 Our readers already know that Akkineni Nagarjuna and Tamil actor Karthi will act together in a bi-lingual film. This movie is touted to be inspired from a french movie, ‘The Intouchables’ which is comedy movie and involves a relationship between a paralysis patient and his caregiver. As per the latest buzz, the first schedule of this untitled movie will begin from March 14th in a specially erected set in Chennai.Vamshi Paidipalli, who shot to fame with Munna, Brindavanam and Yevadu, is the director for this film. Prestigious P.V.P Cinemas banner is producing this movie in both Telugu and Tamil languages. Shruthi Haasan is the lead actress and veteran actress Jayasudha will also be seen in a crucial role. Gopi Sundar is the music director.